We’ve all been there. You’re in a dream, loving life, stress free, when suddenly someone pushes you into a pool, or you fall off of the sidewalk, or in extreme cases like my dream last night, you fall out of a window. Immediately we wake up, sweating, heart pounding, and realize it was all a dream. Well, what if we knew it was a dream all along. Then, we wouldn’t wake up in fear because we knew it was fake. Or, we just wouldn’t let the event occur in the dream in the first place. This concept of lucid dreaming dates back to Aristotle. Over the years, many philosophers have contributed their own personal incidents of these dreams. Let’s get down to how and why this happens to certain people and not others. The most important part of lucid dreaming is the point when you realize that something in the dream does not match up to real life. Whether that be the time, date, or any other nuanced detail you can notice. There are different intensities of this type of dreaming as well. Some people, once they realize what is happening, can control their dreams and make certain events happen to themselves. Now to clear things up really quickly. Lucid dreaming and dream control are not the same. You can control your dream without knowing, and you can lucid dream and choose not to control things. 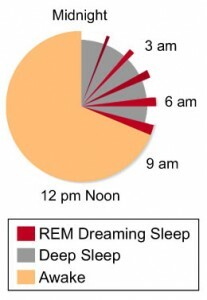 Another method is to catch yourself while in REM sleep, which stands for rapid eye movement. This image helps to explain what REM sleep is, and how it cycles. This is the point when lucid dreams are most likely to occur, so if you can wake up and fall back asleep during this time, you will have a good chance of lucid dreaming. Also, REM sleep is usually in full swing during naps! Amongst these methods are many more which are discussed here in this video on lucid dreaming. Yes, I have tried to make this happen, and I simply can’t. I would love to know if any of you know how to do this, or have had it happen to you before! This entry was posted in Uncategorized on September 13, 2016 by Anna Josephine Wisniewski. The idea of lucid dreaming is such an intriguing one, and I love learning about it! In high school, my Human Behavior’s teacher gave us an assignment during our “Dream Unit” where we would have to keep a journal of our dreams for a week. We did this to later analyze what they consisted of and their possible meaning, but I realize now that it was helpful in becoming aware of these “bizarre” things that let me know I was dreaming, too. I’ve known about lucid dreaming for a long time because the first time I did it was when I was around 9 years old and lived in my first house. The dream was that I in the bathroom of my old home, but I noticed something crazy about my appearance, which was that I was shrunken down to a very small size, and there were a bunch of toys from Toy Story with me – yes, kind of weird. From there, I didn’t feel like dreaming anymore and walked into a wall to wake myself up. Majority of the time waking myself up is how I lucid dream, or if I am having a nightmare I have learned to turn myself around and just ignore what is there. I don’t think I have ever actually been able to manifest my own dream – I can only control my dream (if I’ve realized I’m dreaming that certain night) once I have been given a setting, characters, etc. I have always wondered if lucid dreaming could lead into further or more powerful things, and this website I found gives examples of some of this. One person apparently got rid of their fear of death while another could solve math problems once they woke up. I looked into that link! The person who could solve the math problems by studying them before bed is so interesting. It goes on to say that she then used that to help her through medical school! Wild right? I think it is so fascinating that you have been able to become aware that you are dreaming. I tried really hard to do it, but I simply can’t. Thank you so much for sharing that with me! I was hoping to get a response like that with someone who has experience with it!